Understanding what we mean by calling Jesus "King" invites taking a close look at the witness of Jesus' life, both in the Gospel, and in the sacramental way we experience his love for us and in our actions that help set the captive free. The Rev. 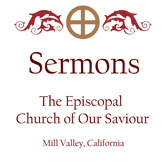 Este Gardner Cantor discusses John 18:33-37 in this last sermon of the church year on "Christ the King" Sunday.